Shrimp gyoza dipping sauce is a small Japanese dipping, toasted on one side. 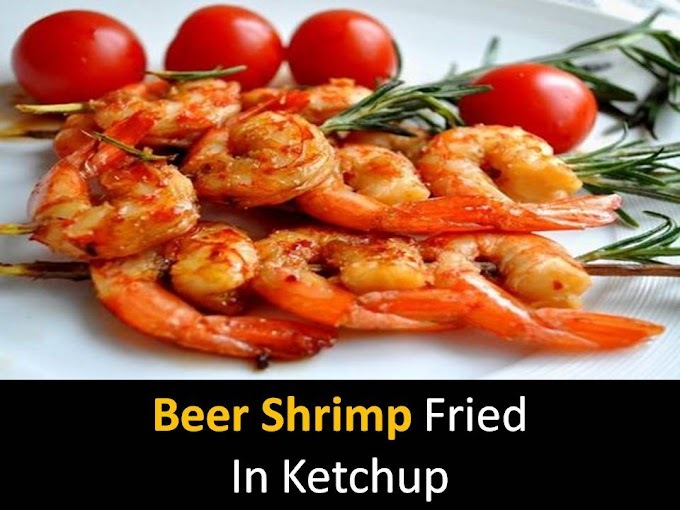 Most often they are found with a filling of pork or shrimp but can be simultaneous with pork and shrimp. To try gyoza, it is not necessary to go to a restaurant - they are quite simple to prepare at home from the most ordinary products. $Step 1 - Sift the flour and salt into a large bowl. Add boiling water and stir with chopsticks to make a crumb. $Step 2 - Pour in the vegetable oil and keep mixing until the oil is completely absorbed into the dough. Then collect the dough with your hands in a ball, wrap in foil and leave for 30 minutes. $Step 3 - Knead the dough for a few minutes on a lightly topped table top. When the dough is smooth, wrap it in the film again and let it sit for 30 minutes. $Step 4 - Divide the dough into two parts. Roll each to a thickness of 2 mm. Cut out dough circles with a diameter of 11 cm. $Step 5 - Peel the shrimp and chop finely. Grate the ginger. Thinly cut cabbage and green onions. $Step 6 - Put all the ingredients in the bowl for the filling and mix well - a slightly sticky filling will turn out. $Step 7 - Prepare a bowl of cold water and a tray, sprinkle it with flour. $Step 8 - Take the dough circle in your hand and place 1 tsp in the center. stuffing. Dampen a finger with cold water and slide along the edge of the dough. 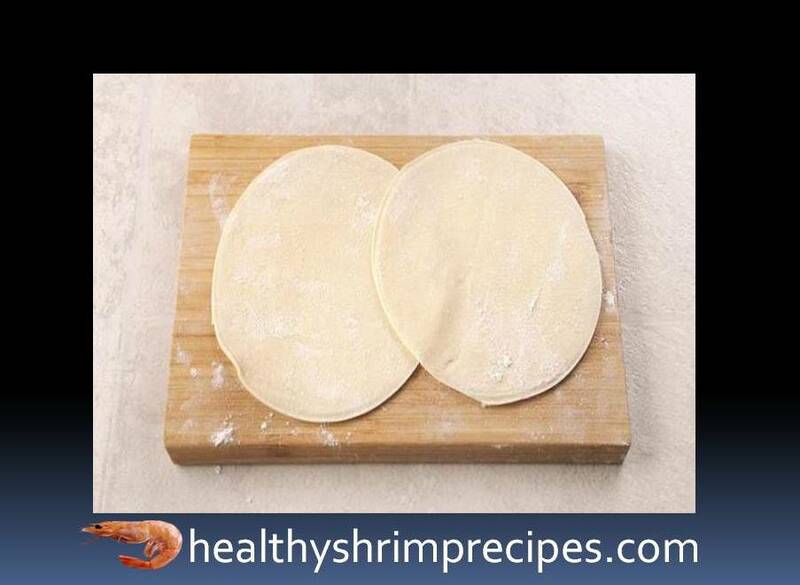 Fold the dough in half. On one half of the dough, lay 5 folds, tightly pressing them to the second part of the edge. 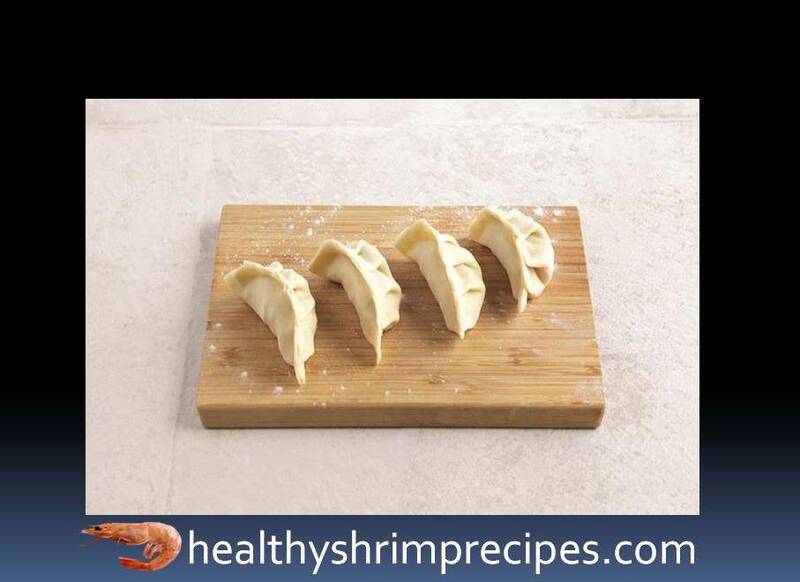 In the end, once again firmly press the edges and shift the gyoza to the tray. $Step 9 - Grease a non-stick pan with vegetable oil using a brush and heat over medium heat. 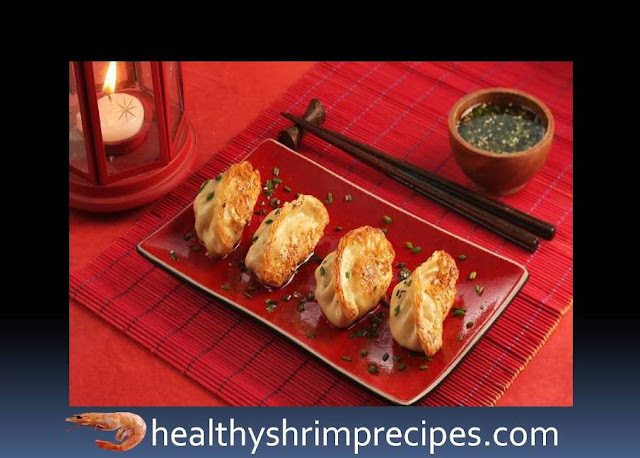 Spread gyoza in a frying pan and fry on one side until golden brown, 30–40 sec. 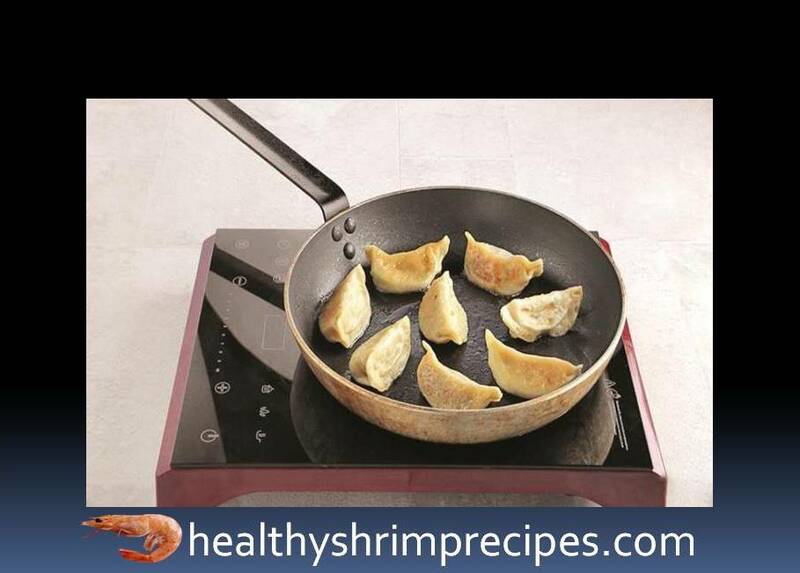 Pour hot water into the pan so that it reaches the middle of the gyoza. Cover the pan with a lid and cook for 5 minutes. $Step 10 - Remove the cap and allow the remaining water to evaporate, if any. Water Gyoza 1 tbsp sesame oil holds on the fire for another 1 min. Put gyoza on a platter with the toasted side up. $Step 11 - For the sauce, mix vinegar, soy sauce, and sesame oil. 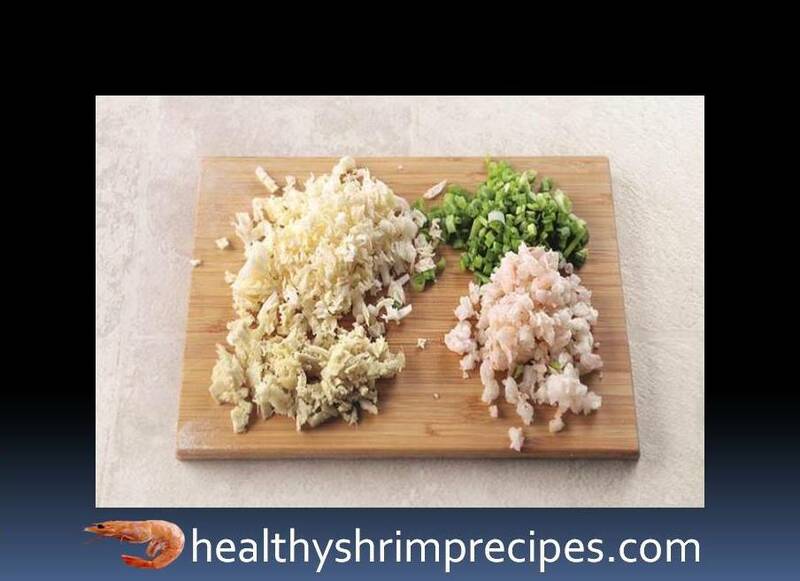 Add sesame and chopped green onions.